My Game Music Appreciation site allows users to interact with old video game music by toggling various channels, as long as the underlying synthesizer engine supports it. Users often find their way to the Nintendo DS section pretty quickly. This is when they notice an obnoxious quirk with the channel toggling feature: specifically, one channel doesn’t seem to map to a particular instrument or track. When it comes to computer music playback methodologies, I have long observed that there are 2 general strategies: Fixed channel and dynamic channel allocation. Most of these players supported the concept of masking individual channels. In doing so, the user could isolate, study, and enjoy different components of the song. For many 4-channel Amiga MOD files, I observed that the common arrangement was to use the 4 channels for beat (percussion track), bass line, chords, and melody. Thus, it was easy to just listen to, e.g., the bass line in isolation. MODs and similar formats specified precisely which digital audio sample to play at what time and on which specific audio channel. To view the internals of one of these formats, one gets the impression that they contain an extremely computer-centric view of music. MODs et al. enjoyed a lot of popularity, but the standard for computer music is MIDI. While MOD and friends took a computer-centric view of music, MIDI takes, well, a music-centric view of music. … and it confused me. There are 16 distinct channels being visualized but some channels are shown playing multiple notes. When I dug into the technical details, I learned that MIDI just specifies what notes need to be played, at what times and frequencies and using which instrument samples, and it was the MIDI playback program’s job to make it happen. Thus, if a MIDI file specifies that track 1 should play a C major chord consisting of notes C, E, and G, it would transmit events “key-on C; delta time 0; key-on E; delta time 0; key-on G; delta time …; [other commands]”. If the playback program has access to multiple channels (say, up to 32, in the case of the GUS), the intuitive approach would be to maintain a pool of all available channels. Then, when it’s time to process the “key-on C” event, fetch the first available channel from the pool, mark it as in-use, play C on the channel, and return that channel to the pool when either the sample runs its course or the corresponding “key-off C” event is encountered in the MIDI command stream. 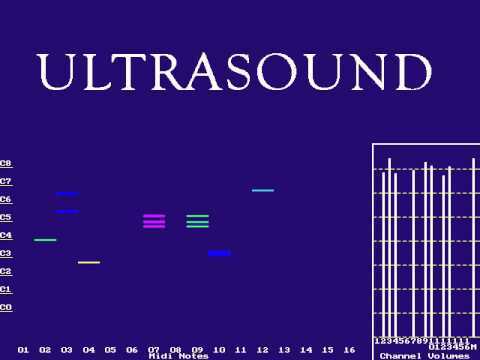 Circling back around to my game music website, numerous supported systems use the fixed channel approach for playback while others use dynamic channel allocation approach, including evey Nintendo DS game I have so far analyzed. Which approach is better? As in many technical matters, there are trade-offs either way. For many systems, the fixed channel approach is necessary because for many older audio synthesis systems, different channels had very specific purposes. The 8-bit NES had 5 channels: 2 square wave generators (used musically for melody/treble), 1 triangle wave generator (usually used for bass line), a noise generator (subverted for all manner of percussive sounds), and a limited digital channel (was sometimes assigned richer percussive sounds). Dynamic channel allocation wouldn’t work here. But the dynamic approach works great on hardware with 16 digital channels available like, for example, the Nintendo DS. Digital channels are very general-purpose. What about the SNES, with its 8 digital channels? Either approach could work. In practice, most games used a fixed channel approach: Games might use 4-6 channels for music while reserving the remainder for various in-game sound effects. Some notable exceptions to this pattern were David Wise’s compositions for Rare’s SNES games (think Battletoads and the various Donkey Kong Country titles). These clearly use some dynamic channel approach since masking all but one channel will give you a variety of instrument sounds. Actually, perhaps I should remove the ability to toggle Nintendo DS channels in the first place. 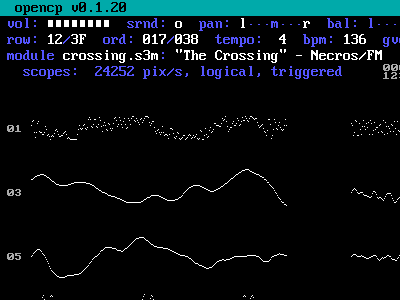 Here’s a funny tale of needless work: I found the Vio2sf engine for synthesizing Nintendo DS music and incorporated it into the program. It didn’t support toggling of individual channels so I figured out a way to add that feature to the engine. And then I noticed that most Nintendo DS games render that feature moot. After I released the webapp, I learned that I was out of date on the Vio2sf engine. The final insult was that the latest version already supports channel toggling. So I did the work for nothing. But then again, since I want to remove that feature from the UI, doubly so. Rewind to 1999. I was developing an HTTP-based remote management interface for an embedded device. The device sat on an ethernet LAN and you could point a web browser at it. The pitch was to transmit an image of the device’s touch screen and the user could click on the picture to interact with the device. So we needed an image format. If you were computing at the time, you know that the web was insufferably limited back then. Our choice basically came down to GIF and JPEG. Being the office’s annoying free software zealot, I was championing a little known up and coming format named PNG. So the challenge was to create our own PNG encoder (incorporating a library like libpng wasn’t an option for this platform). I seem to remember being annoyed at having to implement an integrity check (CRC) for the PNG encoder. It’s part of the PNG spec, after all. It just seemed so redundant. At the time, I reasoned that there were 5 layers of integrity validation in play. So there are up to 5 encapsulations for the data in this situation. 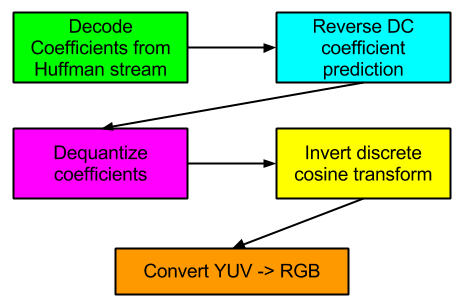 At the innermost level is the image data which is compressed with the zlib DEFLATE method. At first, I thought that this also had a CRC or checksum. However, in researching this post, I couldn’t find any evidence of such an integrity check. Further, I don’t think we bothered to compress the PNG data in this project long ago. It was a small image, monochrome, and transferring via LAN, so the encoder could get away with signaling uncompressed data. The graphical data gets wrapped up in a PNG chunk and all PNG chunks have a CRC. To transmit via the network, it goes into a TCP frame, which also has a checksum. That goes into an IP packet. I previously believed that this represented another integrity check. 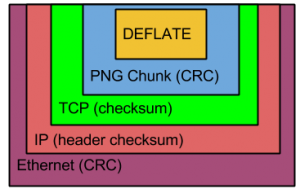 While an IP frame does have a checksum, the checksum only covers the IP header and not the payload. So that doesn’t really count towards this goal. Finally, the data gets encapsulated into an ethernet frame which has — you guessed it — a CRC. I see that other link layer protocols like PPP and wireless ethernet (802.11) also feature frame CRCs. So I guess what I’m saying is that, if you transfer a PNG file over the network, you can be confident that the data will be free of any errors.